This demo shows off how Pixel Vision 8's TilemapChip works. When importing a tilemap image, each tile references a sprite. The tilemap is stored in the TilemapChip and before it can be displayed, it must first be rendered into the Tilemap Chip’s cache. The tilemap cache allows you to store large pixel data in memory and scroll it. 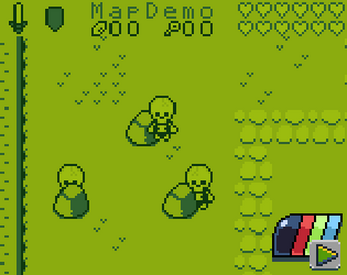 This demo also shows off how to do simple tile animation via palette swapping and rendering sprites above and below the background layer. Hi, is there any chance it compiles to mobile devices such as Android and iOS?